Whether you are a corporate executive on a family vacation or just passing through St. George Inn and Suites will meet your specific needs. We offer a wide variety of hotel rooms including luxury suites family suites executive suites and bridal suites in addition to our standard single double queen and king rooms. Many of our rooms have jacuzzi tubs mini refrigerators microwaves and coffee makers. Take advantage of conveniences like free Wi-Fi Internet access a daily hot complimentary breakfast two fabulous pools and hot tubs Both Indoor and Outdoor indoor and outdoor childrens play place pet area and guest laundry facilities. 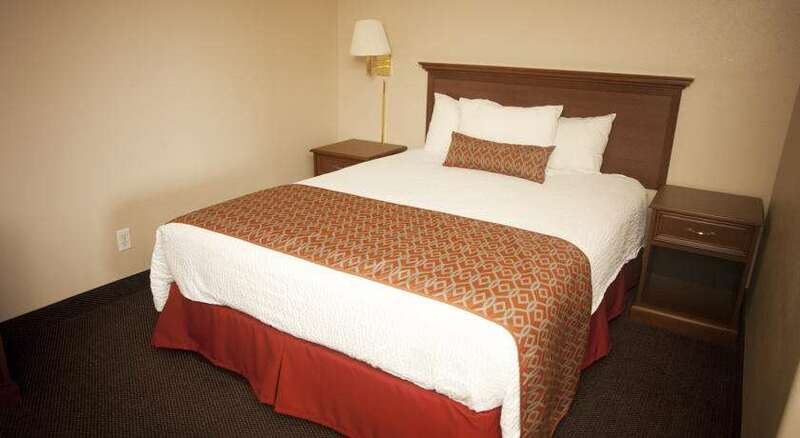 Suites pet-friendly rooms and handicapped-accessible rooms are available upon request. The St. George Inn and Suites is located off I-15 exit 6 in St. George Utah. Our address is 1221 S Main Street. St. George Utah is located in the southwest corner of the state of Utah 118 miles from Las Vegas NV. St. George and its surrounding metropolitan area is well-known for its natural beauty and proximity to several state and national parks including Zion. Reservations must be canceled 24 hours prior to arrival to avoid a penalty of one night room and tax. Exceptions may apply - Please see rate rules. Down-home chain serving all-day American comfort food and desserts in a woodsy setting. Wood and stone accented American eatery for steaks sandwhiches homemade desserts and patio dining. St. George is Utahs golf capital. Weather is mild during winter and so golf is enjoyable year-round. As a result some of the best courses in the southwestern US can be found here. Bryce Canyon National Park a sprawling reserve in southern Utah is known for crimson-colored hoodoos which are spire-shaped rock formations. It has overlooks at Sunrise Point Sunset Point Inspiration Point and Bryce Point. The Grand Canyon is carved out by the Colorado River and is nearly 1500 m deep. It is the most spectacular gorge in the world. Located in the state of Arizona it cuts across the Grand Canyon National Park. Snow Canyon state park enjoys mild winter weather and seldom receives snow. The park was named after early Utah leaders Lorenzo and Erastus Snow. It offers some 16 miles of hiking trails technical rock climbing biking and horseback riding. Zion National Park is a southwest Utah nature preserve distinguished by Zion Canyons steep red cliffs. Zion Canyon Scenic Drive cuts through its main section leading to forest trails along the Virgin River. The Dixie Center is designed with maximum versatility to accommodate groups from 5 to 5000. Featuring a 46000 sq ft column free exhibit hall 32000 sq ft of flexible meeting room space in 19 Meeting Rooms ranging from 185 sq ft to 13205 sq ft. The Brigham Young Winter Home and Office is a historic residence and museum located in St. George Utah. Brigham Young was the foremost Mormon pioneer and led the church to the Utah Territor. Tuacahn Amphitheater in St. George Utah was built in the shadow of 1500-foot red rock cliffs and offers theatrical plays and productions. The Utah Shakespeare Festival presents life-affirming classic and contemporary plays in repertory with Shakespeare as their cornerstone. These plays are enhanced by interactive festival experiences which entertain enrich and educate. ~15 miles from Saint George. Cherished version of the original Liberty Bell in Philadelphia is centerpiece for local July 4th celebration. The sign reads: "Let Freedom Ring!" ~24 miles from Saint George. ~68 miles from Saint George.